How to find material type from chemical composition? We had done material chemical composition test for custom made knife part which is used for shearing the paper and polythene cover materials repeatedly. 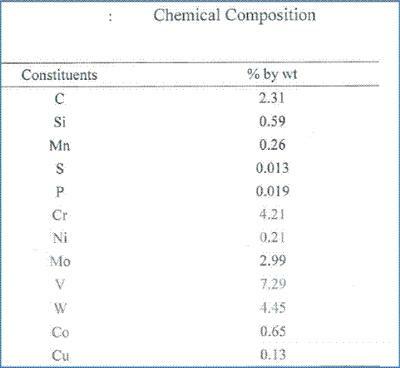 I have the chemical composition (see attached)and want to find right material based on which standard of material it belongs too? Comments for How to find material type from chemical composition? Suggest a material grade for a knife plate for sealing BOPP film @200°c & cutting. Please tell me which material is this. I need the material name for the below composition. I would know which is the right materila? can you help me about the name of the following material? please give me the materials name. The composition that you have specified is not a grade of tool steel. Your composition refers to A-27 70-40 Carbon steel, not a grade of tool steel. This chemistry that you have specified is not a tool or high speed steel. I am sorry, but we are not able to help you to determine what type of material it is. My chemical composition as per below.please tell me exact material for the same. The composition that you posted is not a tool steel, it belongs to the Inconel family of high nickel materials. Neither of these grades that you posted the chemical composition for are tool steels. I suggest that you try to contact a metallurgist at a steel mill for the correct identification. Pls kindly send the material typr for the same. We are looking for a material with the following chemical composition and I would really appreciate it if someone could help us out with it; The material is a steel with hints of following composition. Based on the information that you have provided, the chemical composition indicted, is ASP 2053. This is a high-speed steel that is produced by Erasteel.